I am actually the Magento Schema Diagram author. Was thinking of updating it, so I went looking for my original and ended up here. I originally posted the diagrams to the Magento Forum & Wiki – no idea how they found their way here, but thanks for the comments. Does anyone have an idea where to find Magento 1.8. database diagram? Would like to update this post. I like the way Magento works, I currently have an OSCommerce, and in the process to migrate. Thanks for this post as it was one of the first ones I read about the database because it is confusing however it will make things so much cleaner than OSC. Extremely awesome …. Very good job. I think this will be very helpful to learn magento. Looking at the database schema, I can guess that Magento is a very comprehensive application. But on the other hand, all those overhead of having flexible attributes will cause the app to slow down significantly. I heard a lot of good things about Magento. Coming from Zen Cart, which is a bit slow shopping cart, I am curious to know how fast does Magento run? Ho knows what tool is used for generate this diagram ? What graphic modelin tool ? you are a Genious, thanks a lot. Thank you so much! This is exactly what we needed to make our store operations more manageable. I feel like my life is about to get a whole lot easier. Sadly, it will not. 😉 There are very rare occasions where we would recommend communication with database directly outside Magentos collections. Magento tends to change database structure quite often with each new version, so we would suggest you not to build modules that directly manipulate existing tables. You never know what will change in the next version. Thank you. Your effort deserves a comment. Before Magento, database diagram was always the first item we investigated when we started to learn some platform. However, this is totally different. 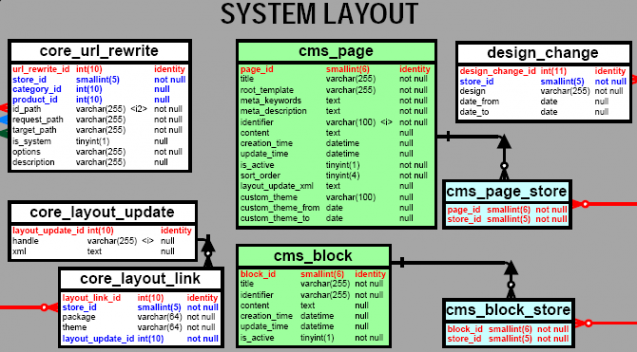 We rarely look into database diagram while working in Magento. You are an amazing person! What an effort. You saved my day and my store.. i have been juggling with all teh tables so far, without knowing what is meant for what. thanks a ton! OMG… thx so much for the diagram!!!! hahahahaha.. long live the relational database! Very useful indeed, thx a bunch! This is a life saver. I’m sort of disappointed Varien didn’t supply this along with a class diagram themselves. By the way I’m still looking for a comprehensive class diagram. Thanks for publishing this, and congrats to Gordon. Astonishing work. Sorry for misunderstanding. Let me clarify something. I’m not the author. The Author is Gordon Goodwin, IT Consultant. You can see his info in the PDF. YES!!!. Very nice. Very helpful. Thanks again. can’t believe someone actually done this! this will surely speed up my progress. I can’t believe no one has take the trouble to thank you for this effort.